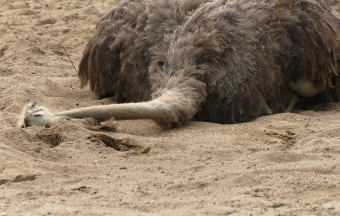 Mark S. asks: Do ostriches really hide their heads in the sand in response to being attacked? Today I found out that ostriches don’t hide their heads in the sand, contrary to popular belief. When an ostrich feels genuinely threatened, rather than hiding its head in the sand, it will take off running- fast. In fact, the ostrich is the fastest animal on two legs having been clocked as high as 45 miles per hour (72 km/h) when being closely chased by a predator. Just as impressive, ostriches have been shown to be capable of a sustained run of around 30 miles per hour (48 km/h) for over a half an hour. They are also relatively maneuverable at these high speeds, using their wings to help them rapidly change course. Thanks to their speed, endurance, and maneuverability, ostriches can pretty much outrun the vast majority of predators out there, with a few exceptions. In the few cases ostriches can’t manage to outrun those hunting them, they can be absolutely deadly with their powerful kicks, with the blow being even more deadly thanks to a large claw on each hoof like foot. They can easily kill a human with a single kick and have been observed to kill full grown lions, if the lion doesn’t get them first. The ostrich also has extremely good eyesight and hearing. Because of this, they are generally able to perceive predators before the predator sees them. What they will do when they observe a predator is press their bodies as close to the ground as possible and wait. Given that they tend to live in very hot savannas in Africa, the heat haze, combined with how low they are to the ground, will make them appear just a mound of dirt in the distance to many predators. If this fails to work and the predator approaches, the ostrich will usually stand up and take off running. The myth that ostriches stick their heads in the sand primarily comes from this first line of defense. From a distance, lying down in this fashion makes them appear as if their heads disappear in the sand, even though what they are actually doing is lying down to see if the predator will pass them by so they won’t have to expend the energy in trying to outrun it. The ostrich is the world’s largest bird, weighing as much as 350 pounds. Ostriches in the African Savannah and desert lands get most of their water from the plants they eat. Ostriches typically live in small herds, with one alpha male and alpha female, along with other females and occasionally lesser males. All of the group’s hens put their eggs in the alpha female’s nest, but with the dominant hen’s eggs given better position. Ostriches prefer to eat plants and roots, but given their harsh natural habitat, will also occasionally eat insects, lizards, or any other creature it can find. They also will occasionally eat sand, which helps them digest the food they eat. Ostriches will generally live 30 or 40 years in the wild, growing up to 9 feet tall and weighing 220 to 350 pounds. 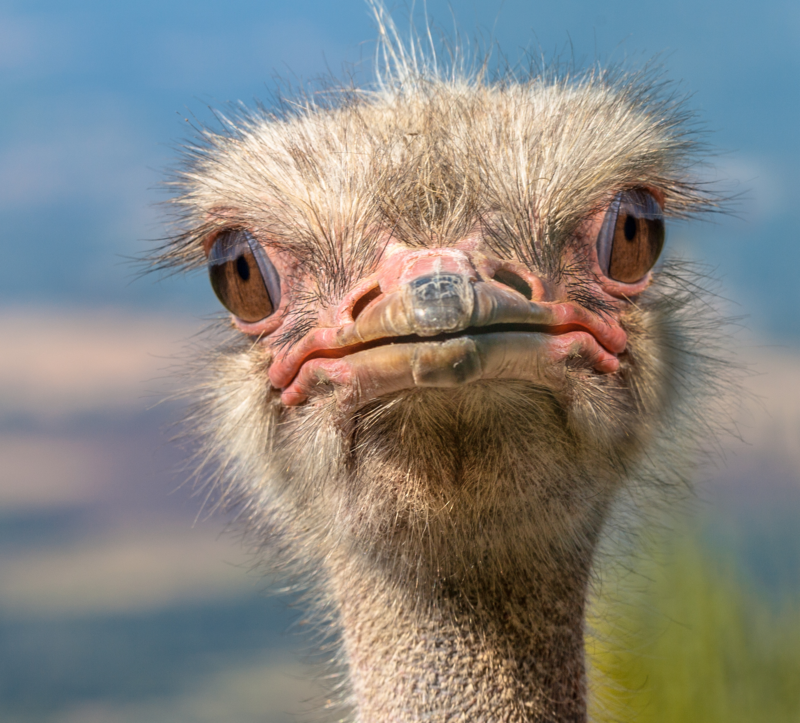 Ostriches have the largest eye of any land animal, measuring in at around 2 inches. The male ostrich is capable of making a “roaring” noise not too dissimilar from a lions roar, but tending to add a hiss with it. Ostriches look so funny, with their tiny heads and pointy beaks. Hahaha. I like ostriches’ eyelashes. No need for falsies. LOL Anyway, how many eggs can a female ostrich have? I usually see one in televisions. Ironically, ostriches are not only the largest bird on earth, but also lays the smallest eggs in relation to their size than any other bird or reptile. On the same note humming birds are the smallest birds on earth and lay the largest eggs in relation to their size than any bird or reptile. Also baby ostriches have a high death rate caused by fright. any animal that knows that he’s food for someone will think of better ways to outsmart his opponent. Unlike the kakapo, a flightless bird , native to New Zealand, it freezes when there is a predator nearby, NO wonder it got nearly extinct.